The capital of Romania offer plenty of pastimes. 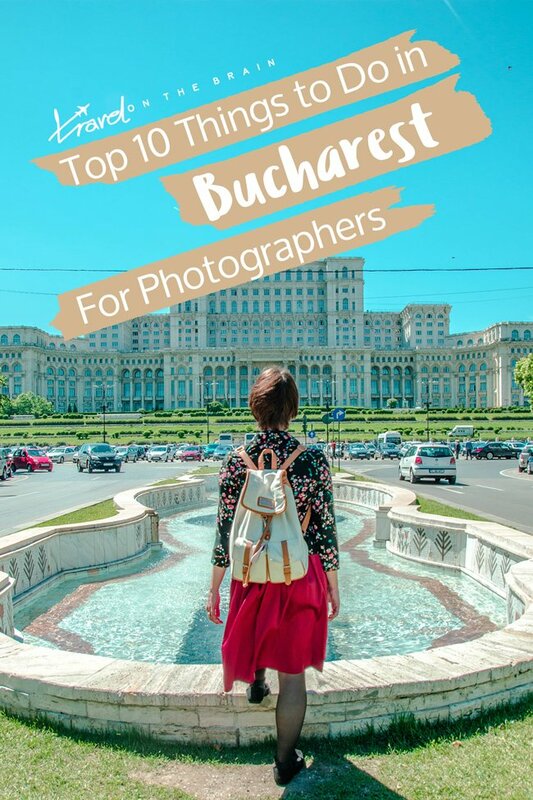 But for photographers especially, there are 10 things to do in Bucharest that cannot be missed. Your camera will love you for it. 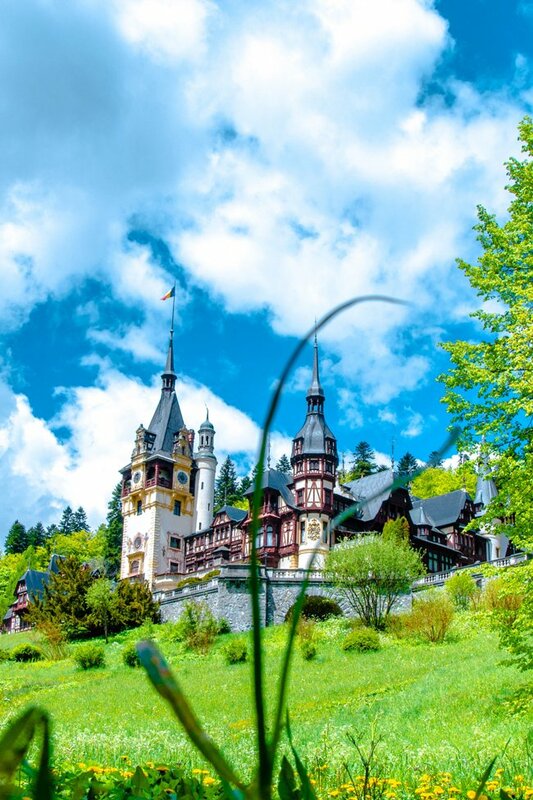 Don’t forget to chck out the other posts in my Romania series. The best way to get a good overview of a new city is to join a walking tour. Luckily, there are a lot of cities in Europe that offer free walking tours, Buchrest included. 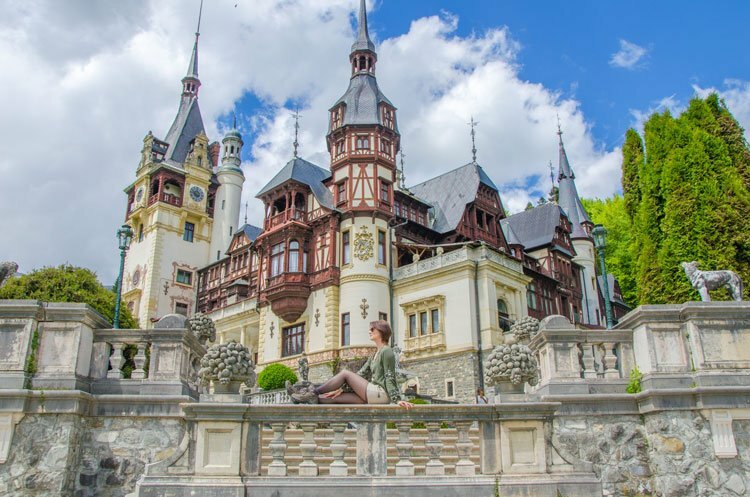 On such a tour, you will be introduced into the city’s medieval history, its French architecture and Communist epic city planning (and what an earthquake had to do with it) and some insights into the famous Vlad Tepes, also known as Dracula. Who knew Bucharest was such a colourful place to be? If you know where to look, you can find a street covered in graffiti, political street art shouting from every wall and abandoned buildings decked in colours and letters. The number one location to check out is Strada Arthur Verona, closely followed by Calea Grivitei and Strada Berzei. The intersection of Strada Arthur and Strada Dionisie Lupu in particular is striking as it is constantly changing. Every year a new mural is commissioned and it is said to have special powers. Whatever is sprayed on there, somehow references future events. So better check it out to know what is about to happen. 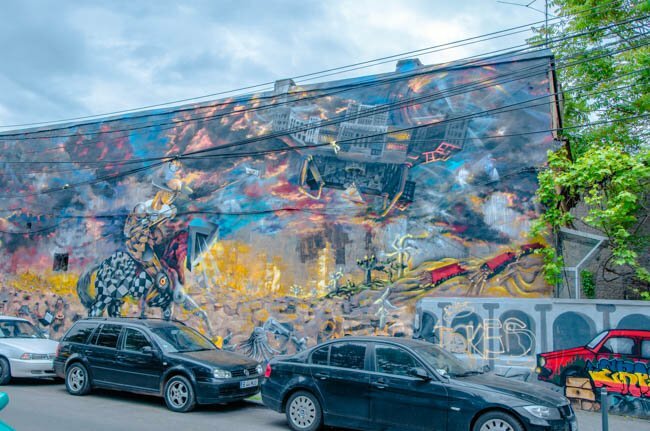 A super low key and under-the-radar location for Bucharest street art is the abandoned factory Chimopar. You take the subway line M2 (Red Line) in the direction of Angel Saligny and get off at Nicolae Teclu. Be aware that parts of the factory are still in use so you might have to negotiate with security if you’re stopped. Religion was frowned upon during Communism so to keep being able to perform religious practices, such as going to church, people had to be creative. Historic churches would have been demolished in no time at all (and many were), and Nicolae Ceaușesc hated their mere sight. So what happened was that building complexes were constructed around such churches to hide their existence. One place to start is walking behind the walls of the Nicolae Ceaușescu’s Centrul Civic project. You cannot miss it, as it was supposed to emulate the Champs Elysee but in an intimidating and pompous Communist building style. It’s basically a wall of housing units etched into the centre of Bucharest. Such religious buildings are the Mihai Vodă Monastery and the Parohia Sfinții Apostoli (Holy Apostles). 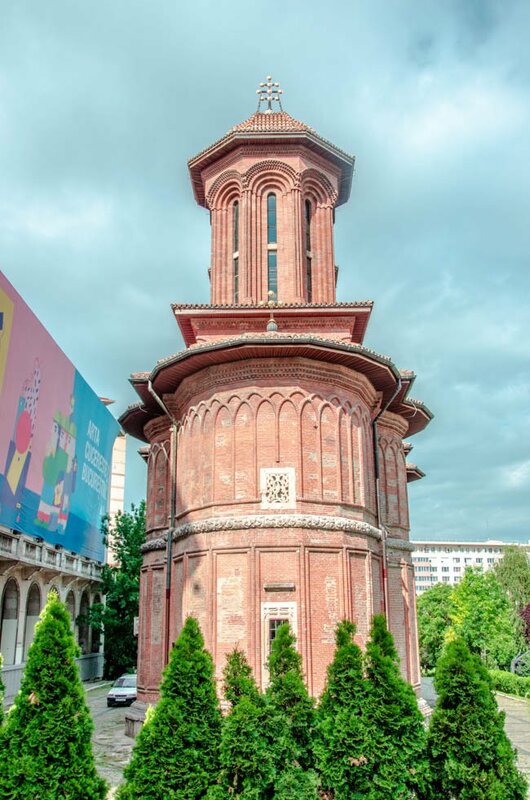 Unobstructed views of Romanian churches can be had in the Old Historic centre. The oldest preserved church in its original state is Old Court Church, which dates back to 1559. This is where the Wallachian Princes were crowned and you can see a bust of Vlad Tepes outside as well. My favourite spot, however, is the little Stavropoleos Church (1724). Thanks to its complete renovation you can now admire the cloister court covered with pretty ivy and crooked tomb stones standing around. 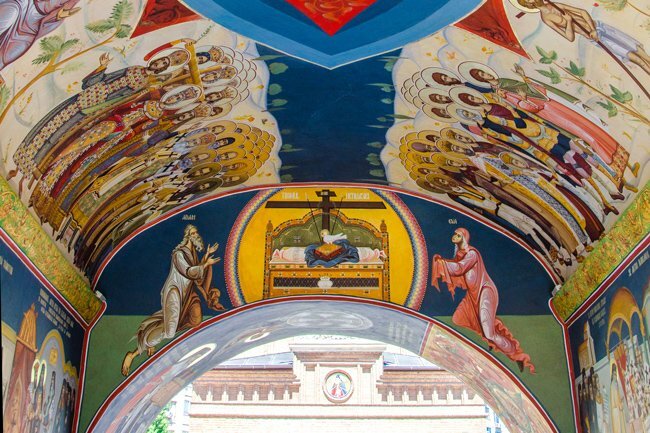 Go inside and marvel at the delicate wall paintings and golden ornaments. Did you know Bucharest is perfect for foodies? And many of them, like the churches, are well hidden. 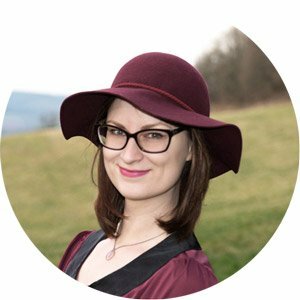 (Good thing I made a guide on the cutest Bucharest cafes.) Think colourful umbrellas in hidden gardens, shady backyards with lightbulbs hanging from the trees and water colour painting exercises to pass the time waiting for that giant oreo cookie cake. The coffee scene is also rapidly on the rise and you can get great blends if that is more up your alley. 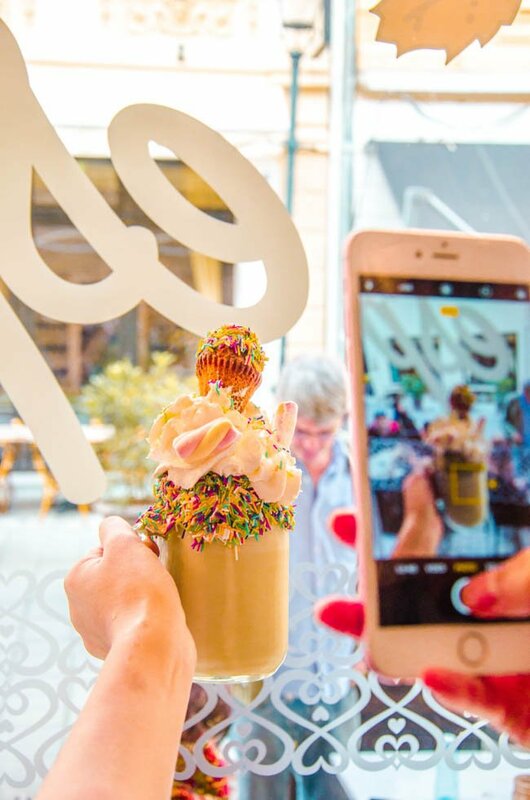 For me, I love a good milkshake and those can be had in Bucharest as well. If you have more of a sweet tooth, know that there are plenty of bakeries on every corner and basically getting a bit of everything is super cheap. Yay! Bucharest is a party destination and as such, the streets are wild on weekends. However, as a photographer you might be much mor interested in rooftop bars and wonderfully illuminated streets. Old Town is the place to be for this! It’s one of the top things to do in Bucharest anyway, both day and night. In case you want to capture traditional Romanian attire and music scenes, dine at Caru’ cu bere during one of its daily live music and dance events. 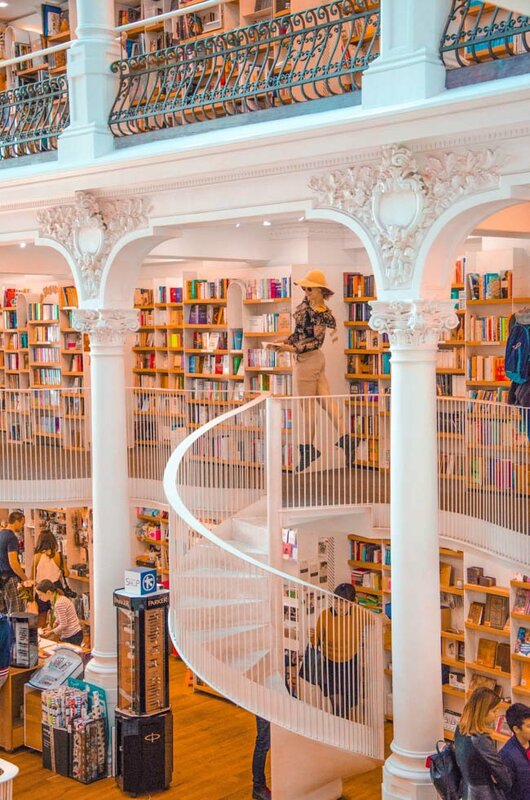 No matter if you love books and could just get comfortable reading for hours or want a place to browse in peace, Bucharest has the best local franchise. Carturesti Carusel is the place – or two places – I am talking about. Its central shop, right in Old Town, will invite to do an impromptu photo session, gliding down its white winding staircases. The more vintage looking Carturesti Verona store close to Strada Arthur Verona offers a perfect retreat. Stroll through its many rooms, pick a nook or sit outside under the trees. I never wanted to leave! Besides books, you can find a myriad of souvenirs, novelty gifts and stationary. 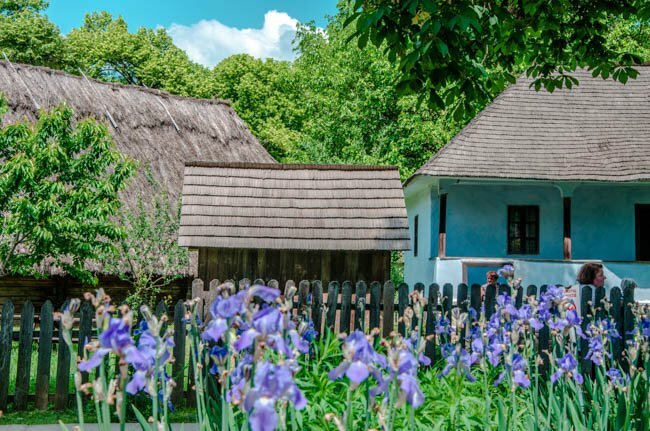 If you are curious what Romania looked like a few centuries ago, the Village Museum in the North of Bucharest should be on your list. “Dimitrie Gusti” National Village Museum dates back to 1963 in an effort to preserve Romanian cultural heritage. Today, the museum as accumulated 360 monuments, 60.000 objects and over 250.000 documents on an area stretching 14h hectars. You can easily spend 1-3 hours in this village, exploring every house. In many of these, you can walk inside and look at the way houses were structured, furnished and adapted to respective trades and living conditions. If you want to make the most out of your visit, check the event calendar in advance to take advantage of festivals, theatre plays and exhibitions, for example. Bucharest has many abandoned places and one of the coolest ones is a tub turned urban park. Originally, it was designed as an artificial water basin, called Lake Văcărești, to establish a hydrological infrastructure plan. Under Communist rule, there was plenty ambitious city planning going on. However, in 1989, it was abandoned entirely and by now, nature has fully reclaimed it. 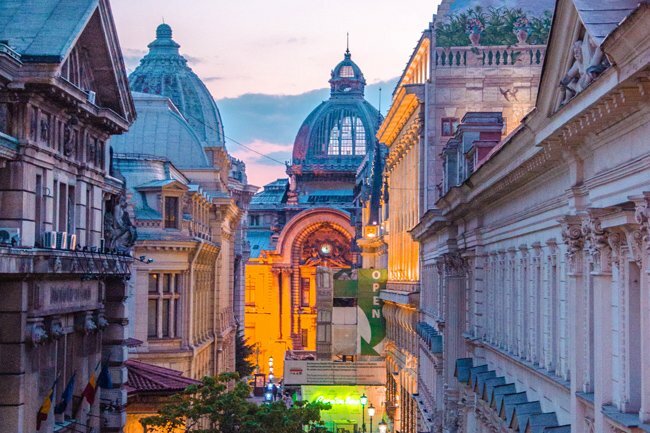 Rarely anyone visits, making it an ideal and true off-the-beaten destination in Bucharest. Photography lovers that also appreciate nature will truly rejoice. There is a special bird watching area as there are around 100 bird species in the park. In fact, the entire construct has veen officially declared a protected area. Thanks to that (and its 183 hectares), Văcărești is now one of the biggest urban nature parks in Europe! Close to the Village Mueum, you can find the Arcul de Triumf.I t didn’t always look like its French counterpart. Right after the Romanian independence in 1878, it was constructed with wood to allow for military parades. Now, it is 27 metres high and its current look dates back to 1935. Unlike the French Arc de Triomphe, the sculptures adorning the sides are from famous Romanian sculptors. To see the official military parades, visit on December 1, Romania’s National Day. There is a small staircase inside so you can visit. However, this is only possible – and free of charge – during Romania’s National Day. There are plenty of day trips from Bucharest. 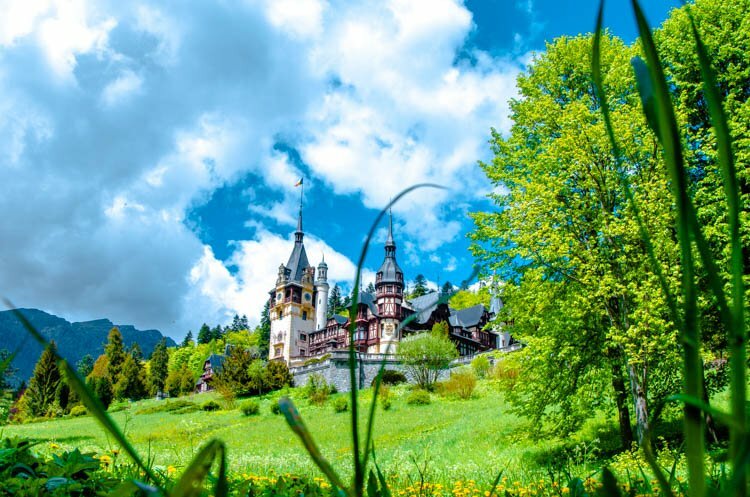 You could plan a road trip up to picturesque Sinaia, Peles Castle and Bran Castle. Or, just book a Dracula tour. 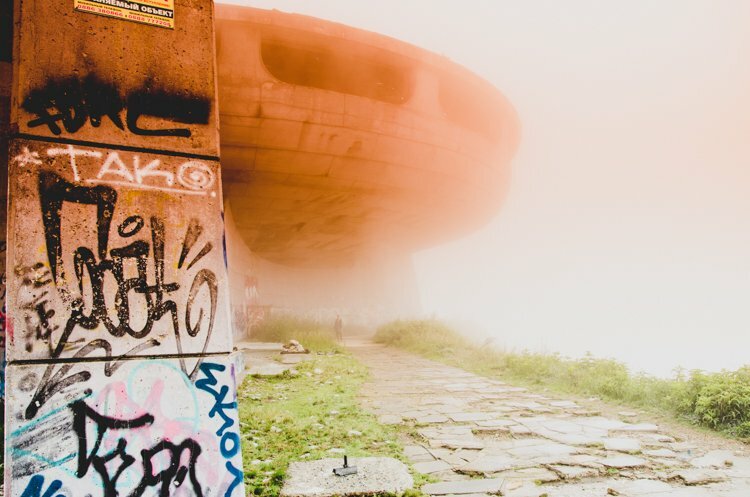 Alternatively, why not check out Bulgaria? The border isn’t that far away and a town that I highly recommend is Veliko Tarnovo with its fortress, old mountainous villages and beautiful landscapes. Again, there are full Bulgaria day trips available if you prefer small group tours. 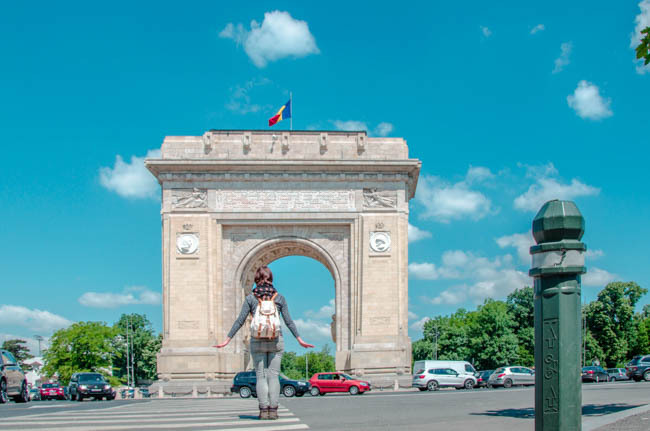 Are These The Only Things to Do in Bucharest? 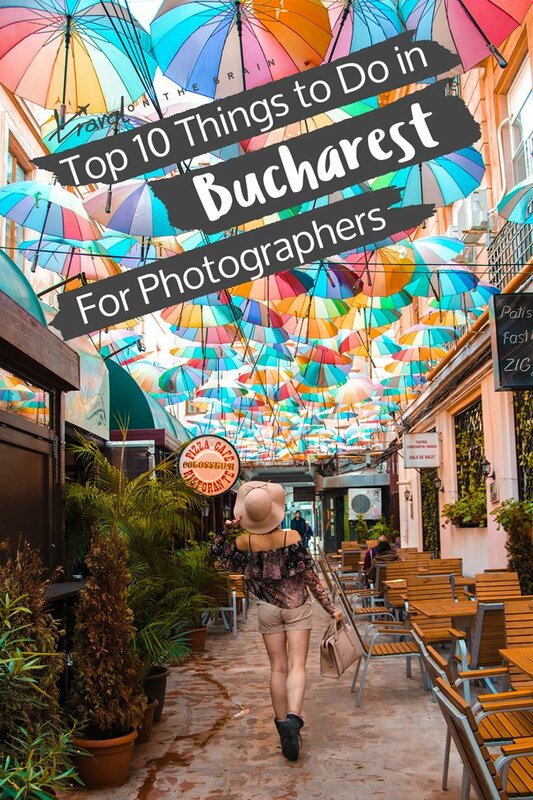 Bucharest has so much to offer and I tried showcasing the top 10. These are my personal favourites but yours might be slightly different. 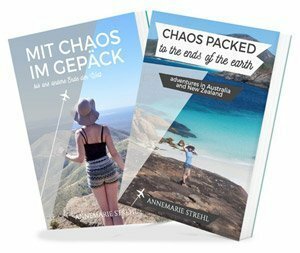 Maybe visit and see for yourself? 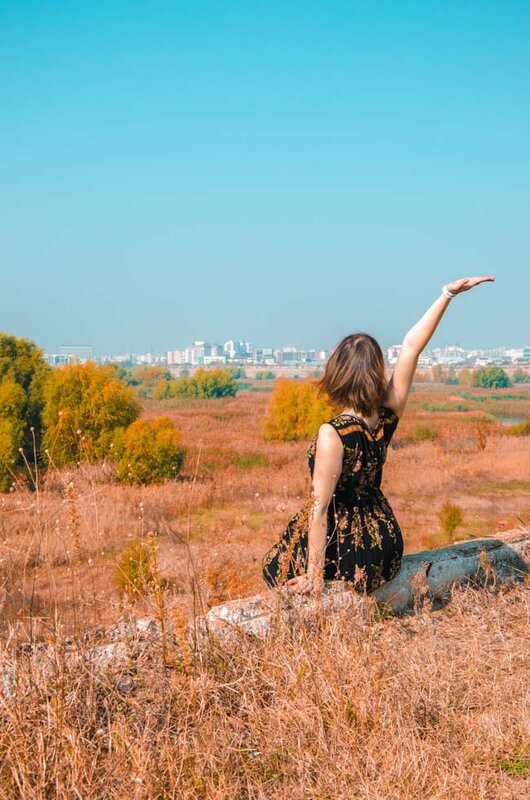 Join a public dance in Old Town, visit a local market, take a tour around the city fringes, learn about Roma culture (and erase your misconceptions and stereoytpes), sample local cuisine, … there is a lot to do in Bucharest. Tell me, which of these things to do in Bucharest piqued your interest?